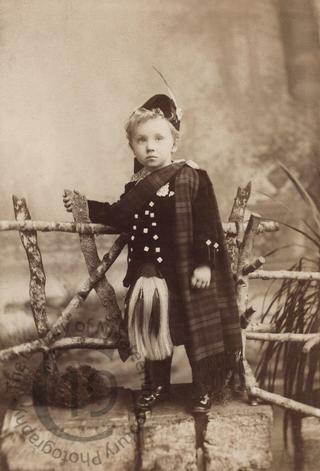 A cabinet card portrait of Leslie Franklin Kennett, photographed in Scottish costume when he was aged ‘2 years and 4 months,’ according to an inked inscription on the reverse of the mount. Born at Brockley in South London, Leslie Franklin Kennett was baptised at All Saints in Deptford on 30 June 1895; he was the son of Walter Richard Kennett and his wife Jane Isabel née Clift. The family appear on the 1901 census living at 9 Harton Street in Deptford with Leslie’s younger brother Walter and three servants. Walter senior gave ‘Pawnbroker’ as his profession. Leslie Franklin Kennett died at Greenwich in South London in the March ¼ of 1916. He was 20 years old. Photographed by Hellis and Sons of London (various branches including one at Deptford Bridge, Greenwich).